This coming weekend is Doors Open Ottawa, and there are about two dozen sites in Centretown and Somerset Ward alone (which I've listed and linked to below). Doors Open Ottawa still needs volunteers, so get in touch with them if you're willing to help out for a couple of hours, even on just one day. One location, just outside Centretown, is the Chateau Laurier hotel, which is celebrating its 100th anniversary this year with its counterpart, Union Station. Much has been said and written about the Château (including a few posts on this blog. The two were opened in April 1912 by the Grand Trunk Railway system, and connected by a pedestrian tunnel uner Rideau Street. This tunnel will be open to the public for Doors Open Ottawa this year, a particular treat. The Chateau will have special displays celebrating the century mark. In 1911, prior to the hotel opening, these 14" wide colour posters were sent all around the world to promote the new hotel. 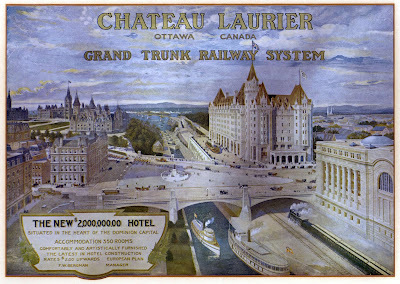 David Jeanes, a local expert on railway history in Ottawa, recognized the image: "This poster is the same image as the framed print which used to hang in the main lobby of the Chateau until the end of the Canadian National era. It was done in 1911 by the famous creator of birdseye views, American artist Richard W. Rummell." This particular one was purchased at an antique show a few decades ago, and hung on the wall in my parents' TV room growing up. Its colours have washed away, so the image above is after some adjustments in Photoshop. The image shows the old Post Office and City Hall on what is now Confederation Square, the old Parliament buildings before the fire of 1916, the Alexandra (interprovincial) bridge and canal locks, trains running along the canal, streetcars and horse-drawn carriages, and of course the Chateau Laurier and Union Station. For a more detailed (and illustrated) history of the Château Laurier, check out Vintage Chateau and Chateau Laurier: 1928 Wing on Urbsite, posted in 2009. In previous years, I've blogged some Doors Open Ottawa locations outside Centretown, including the Delegation of the Ismaili Imamat and the former Ottawa City Hall on Sussex. Here's a list of locations on this year's official list of Doors Open Ottawa locations that are in Somerset Ward (* = in Centretown). Many are on the new free shuttle, and nearly every church in Centretown is on the list. Make sure to check the official website to confirm the hours and other restrictions. The numbers are linked, where possible, to the item in the official listing, and the building name is linked to relevant pages on this blog. The following message was recently sent to the e-mail list of the Centretown Citizens Community Association by CCCA President Jordan Charbonneau. I've added the photos to this version. Join the CCCA, follow @CentretownCCA on Twitter, and get on the e-mail list to receive 2-3 updates per month from the CCCA. Note that Images of Centretown is my personal blog and not a blog of the CCCA. I've outlined below some of the events and initiatives of note in Centretown. More information on upcoming events is available on the CCCA website, which I encourage you to check often. Centretown Community Design Plan Meeting: This is certainly the biggest CCCA-sponsored event so far this year, and probably for the last few years! Members of the CCCA, in particular Joan Spice and Judy Forrest, have been working extremely hard to prepare for this meeting on 30 May 2012, which is intended to inform and engage Centretown residents regarding the soon-to-be-finalized Centretown Community Design Plan. George Dark, the consultant who led the creation of the plan, and several CCCA and City figures will be in attendance and presenting on the plan. See the attached poster for more information (which I encourage you to print and post around the community or send electronically to your networks) and come out to the meeting to take part in the discussion of this extremely important document! Minto Park Sale: While the community design plan meeting is our main focus at the moment, don't forget that Councilor Diane Holmes' annual Minto Park Sale will take place from 8 a.m. to 2 p.m. on Saturday, 16 June 2012 in Minto Park! 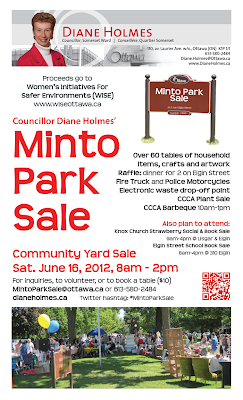 If you're interested in participating, send an email with your home address and a contact phone number to MintoParkSale@ottawa.ca ($10 per table rented). The event will include a CCCA BBQ, bake sale, plant sale and electronic waste collection service (see the Recycle Your Electronics website for exactly what we can take as part of this service. Note that it does not include light bulbs or things like toasters). I have attached the poster for this event; feel free to distribute it as well! Heritage Conservation District Study: A reminder that, this summer, Heritage Ottawa is helping conduct a study of heritage conservation districts (HCD) in four Ottawa neighbourhoods: Rockcliffe Park, New Edinburgh, Lowertown and Centretown. In order to pull it off, however, they need volunteers! There will be a two-hour training session in the evening of Monday, 4 June 2012, and conducting the survey itself takes just a few hours. If you're interested, please respond to this email by next Tuesday, 22 May 2012. Buzz Deliverer: Don't forget that the Centretown Buzz newspaper is always looking for volunteers to help with delivery. In particular, they need individuals with a vehicle to make some of the larger deliveries (gas reimbursement negotiable). Let me know if you're interested, or if you'd like more information. Transportation Committee Chair: We are currently looking for a chair for our Transportation Committee. If you have an interest in transportation-related issues (and that's pretty broad! ), let me know. The committee usually meets once a month to review and discuss transportation developments, but the role could be yours to shape! Many thanks to Robert Dekker, CCCA vice-president and co-chair of the Planning and Development Review Committee, for his excellent work in this role.For more information on the CCCA, including its meetings, see our website. On Elgin street, at 3pm in winter: at least seven people are waiting for one of three northbound bus routes that serve the stop at Elgin and Cooper. They're crowded on a busy sidewalk that is barely wide enough for two people to walk side by side. If you've ever tried to walk into the front doors of the Mayflower a few minutes after the last bus arrived, you probably have had to move aside some people waiting for the bus to do so. The City's Downtown Moves study has recommendations for measuring pedestrian levels of service. This is a first for pedestrians in Ottawa, but is used rigorously by the City's traffic department for ensuring motor traffic moves smoothly to the detriment of all other road users. The chart shown for pedestrians, as well as others in the documents (which I don't think are online) talk about pedestrian levels of service in terms of flow of pedestrians, as well as how many of them bunch up at corners waiting to cross in one direction while others are trying to get through in the other direction. I didn't see anything about pedestrians bunched together waiting for the bus. Not that it's a surprise, but the pedestrian levels of service are obviously designed so conservatively that no sidewalk, except maybe in the middle of the downtown core, will every be considered to have a "failed" level of service and therefore require widening. Not to mention that this is a planning document intended for discussion, not an engineering standard to which the traffic engineers are so faithfully wedded. 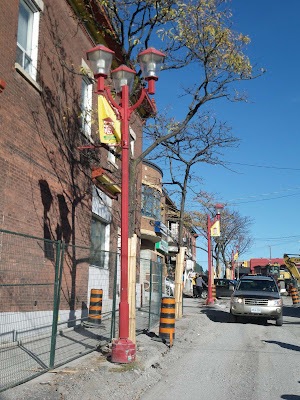 After a couple of months and 15 posts, we have come to the final part in the 15-part series documenting the reconstruction of Somerset Street West from the O-Train tracks, to Preston Street, and onward up into Chinatown to Booth Street. This final post looks at the decorative and artistic elements of the reconstruction, including the four different street lamp designs, the public art component, and a few other artistic flourishes. This is over and above the previous posts that looked at the design of the sidewalks through Chinatown and the trees and bike racks. On Monday night, the power went out in much of the south-west section of Centretown (roughly 417 to Gladstone, Bank to Bronson), which was the first indication to many that something was amiss. To my recollection, this is only the second time this section of Centretown has lost power in the six years I've lived on Gladstone. A big crowd of neighbours were out watching the flames still shooting from the roof, likely motivated by the power outage and Summer-like weather at sunset. Police closed off Kent Street and Arlington Avenue in the two blocks in either direction on both streets. Here a firefighter is near the top of Ladder 13, which is extended between 511 Kent and the next house up. 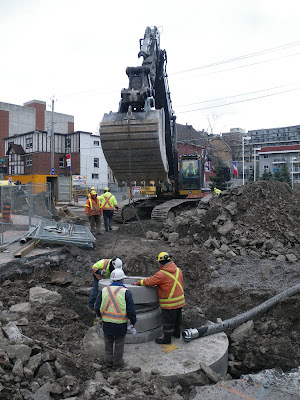 Just as the work is underway to put the finishing touches on the reconstruction of Somerset Street west from Booth to Preston to the O-Train bridge, this 15-part series documenting that reconstruction is nearing an end. After going over the roadway and sidewalk reconstruction and the O-Train pathway, we finished off Part 13 with a look at the temporary boardwalk cantilevered over the side of the Somerset bridge while the O-Train pathway was being built (covered in Part 12). Today is Wednesday, which brings with it the weekly Peds on Weds post about walking issues. Being the second Wednesday of the month, tonight is also the monthly meeting of Walk Ottawa, the upstart pedestrian advocacy group. At tonight's meeting there will be representatives of the City's traffic signals department to take questions from the group. I thought this was a good time to share what I know about how pedestrian traffic control signals work in Ottawa. I don't necessarily agree that this is the way things should be, but it is the way they are. It would appear that Hackett Shoemakers, in the basement of the unit next door, is still there. Almost exactly two years ago, URBSite did a blog post on the history of this building showing many of its intricacies. Everyone in the neighbourhood has been affected by the Bronson Avenue reconstruction project, which has been going on for just over a month now. While most concerns go to the traffic department's project team, working on the Bronson file in the councillor's office (as well as being on the DCA and the CCCA and handling the @RescueBronson twitter account) means I get to hear from many people about the issues they're facing: shops along the street are suffering major drops in business, residents on and near Bronson have to put up with the very noisy construction work starting early in the morning, and people everywhere in the community have to deal with drivers treating their quiet side streets and school-zone main streets the same harsh way they treat Bronson: like a highway to be crammed tight at rush hour and sped through the rest of the day, all to get through the neighbourhood as quickly as possible with little regard to the people who live there. This is just a small sampling of the issues people are dealing with. Luckily, it's not all bad news. The nighttime drilling, which was done on extremely short notice, is over for this year's construction. There has been lots of behind-the-scenes work to look at ways to address the speeding and other traffic issues on the side streets, including temporary and permanent measures (such as signs and speed humps, respectively). A digital speed board, which displays your speed as you approach it, has been installed on Booth Street next to the 40 km/h sign in front of St. Anthony's Church. The police have been doing lots of enforcement of persistent traffic problem areas. If all goes well, some new sharrows will be painted next week. To connect all this to the above photo of workers installing a big sewer chamber at Bronson and McLeod, there has been a recurring theme: despite the other problems, people say that the construction crews on Bronson itself have been very accommodating. If you get a chance, take a walk down Bronson Avenue at least once a week. It's easier now that there's no traffic. Discover the businesses on the street and visit them often. It's not the businesses' fault the road is under construction, and they need the support of their neighbourhood to make it through eight more months of construction. While looking for a vantage point recently to check out the work on the Portage/Wellington intersection roadwork (they're adding crosswalks), I stumbled upon this pond in the Garden of the Provinces and Territories, a park nestled between Lebreton Flats, the Parliamentary Precinct, Centretown, Dalhousie, and Cathdral Hill. The park has won a few awards, though I've never seen it with many visitors. What struck me about this pond (I assume it's a pond in the summertime) is the little steps on the left. Presumably, this is a little walkway across the pond. Well, evidently you can. And while it doesn't quite pull off the look of the Myst computer games (despite being devoid of other people), it does look nice and has weathered well. I look forward to seeing it in the summer when the water is turned on! For this week's Peds on Weds content, check out How Walkable is Ottawa? on Apt613, which has many links to pedestrian-related news and resources. Also make sure to check out JanesWalkOttawa.ca for a Jane's Walk this weekend near you.